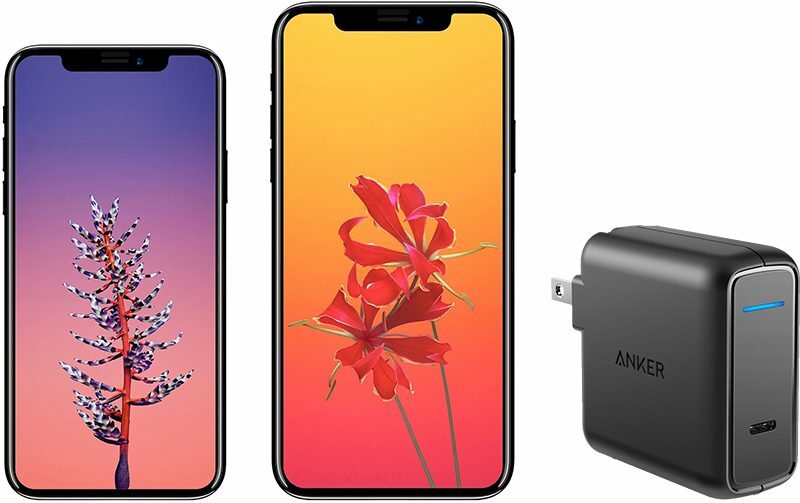 Rumors suggest Apple will bundle a faster 18W power adapter with its next-generation iPhones, expected to be unveiled this September, but third-party fast charger compatibility may be limited. Japanese blog Mac Otakara, citing information from suppliers, claims that third-party fast chargers may require USB-C Authentication [PDF] certification, or C-AUTH, to charge the 2018 lineup of iPhones at full speeds. Otherwise, the iPhones may display a warning, and limit charging speeds to a max of 2.5W. USB-C Authentication is intended to protect against non-compliant USB chargers and to mitigate risks from maliciously embedded hardware or software in USB devices, so core to Apple, this seems to be all about extra security. Apple is one of over 1,000 member companies of the USB Implementers Forum, so USB-compliant fast chargers are available from a wide variety of brands. Before purchasing a random fast charger from the likes of Amazon, though, it may be a good idea to check the list to see if the company is in fact a member. Apple loses either way: if they do this, people will complain that Apple is being closed as usual. If they don’t and iPhones start exploading because of possible uncertified shady chargers, then Apple gets the heat as well. Ah, yes, security reasons. Specifically, the security of being able to charge $10 / piece for an encryption key. Why is the fallback speed 2.5W? Shouldn't it be at least 5W, which is the power that 99% of chargers support? Apple locking users into expensive cables and chargers again! Although from a safety perspective I can understand why they are following this route too! Are you confusing C-AUTH with MFi? One has nothing to do with the other. Closed how? Plenty of companies offer accessories that meet C-AUTH specifications. That has nothing to do with Apple. Yeah... but there is an easy way to fix that WITHOUT locking out 3rd party chargers: require specific user authentication to enable DATA in addition to CHARGE. Problem solved... without vendor lock. This doesn't lock out 3rd party chargers. This isn't MFi. It's C-AUTH. Apple MFI certification is already done on the charging cable. This is about limiting fast charging on the powerbrick side of things to authorized and safe chargers. C-AUTH isn’t an Apple standard nor uses an Apple chip or results in a royalty paid to Apple. This is fine with me...as long as Apple's existing USB-C chargers are already compliant. This will be extremely stupid if the 29w charger I have for fast charging my iPad won't work for fast charging on a new iPhone. It is already incredibly stupid how much I have to swap around cables between lighting/USB-C for my latest Apple hardware. For people's own safety so they don't catch malware. After the reports of fires from cheap Chinese knock-offs, I can see how this would be a good thing! Why can't you just decide to tell the phone to charge unless you want to tether? Unlock to set. Surely in that situation the USB port is safe? My Android phone does that. Am I missing something? I don’t think this is the popular opinion - but I agree with what’s being said in the article. I feel it’s best to be safe when it comes to power and charging. Just my use pattern, but I only ever charge my iPhone overnight, and 5W is more than enough for that daily recharge. I can absolutely appreciate faster charging, but I think one should be careful with chargers and cables for this use. I do think Apple should have decently priced USB-C fast chargers for those who’d like to make use of it.